» Can I use mini-USB of UC3B to program? Can I use mini-USB of UC3B to program? Finally, I finished building my designed experiment boardwithAT32UC3B0512. However, when I want to flash the program inside, there is a question occurred to me. Which way of programming is cost-effective or effective? How? I thought that the USB was the cheapest way for I dont need to buy MKII or UART TTL USB. But.. How can it be done in AS7? If someone has some other methods other than Jtag, it may be another cost-effective way. To use USB to program, you will need a bootloader program in your micro, and something on your pc to talk to it! But you will need some type of ISP (jtag) to load the initial bootloader code into the micro..... something of the chicken or the egg situation! As has been said here many times, an Arduino is a great way to get started, proven h/w, easy to use, and you can use it as your first ISP programmer to load your bootloader in your next project. You have JTAG; use it! Not just for programming - also for debugging. So does it mean that I have to get a Jtag debugger which is much more expensive than my board? A JTAG debugger is an investment - no developer should be without one! If cost is an issue, why not just get one of the many cheap dev boards available these days with the debugger built in? Unless chips are supplied with some kind of bootloader already programmed in then you always need some kind of programmer/debugger to get the first code in even if that's going to be a bootloader so you can then switch to another programming mechanism. 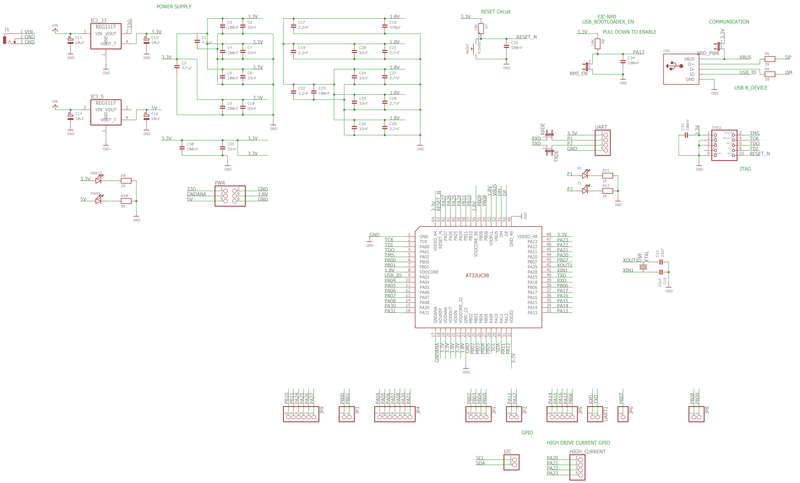 Now in the AVR8 series of chips it is only (most of) the chips with USB that Atmel supply with bootloader code preprogrammed. I know nothing about the almost pointless UC3 series of AVR32 but just maybe Atmel might preload them with USB-DFU bootloader code. What does the datasheet say? Yes, I found a document about USB DFU of AT32UC3B. It said that a bootloader is preprogrammed after factory. chiperase) or if the user wants to program a previous version. However, when I did what the document said, my computer shows no reaction. pressed while releasing the reset push-button. This will open a new hardware installation window. , where 'pressing the joystick' is to press PA13. As you can see in my scheme, I have already set the reset and NMI(PA13)(by default) switch. Are there any other things not fine in my board or computer(Win 10)? Or must I use Jtag to reprogram it? And another very serious question comes out: how to program it when it needs to be batch produced without JTAG port? So in EVK1100 (01) what does "pressing the joystick" do. You clearly need to mimic the same signal. The way most chips with DFU (USB) work is that usually when reset the DFU bootloader does not run. You want it like this so that what actually starts is the USB code in your application that might choose to appear as CDC or MSD or MIDI or whatever. You don't want the AVR to appear as a DFU. But every once in a while, when you start you actually want to reprogram the chip and on those occasions you do want the bootloader to run so it starts up as DFU. Clearly in EVK1100 it is the joystick button that says "DFU not anything else". So you likely need that same type of selection. Now I don;t know the part used but I *think* that is saying that a press on CTR (center button?) will be connecting EXTINT to Gnd. So it looks like that is the trigger, at reset, to make the UC3 enter the DFU bootloader. so it's going to kind of depend as to what the default state of config word 2 is in your UC3 as to which pin it is looking for to activate the DFU at power on. The AVR UC3 have 32 general-purpose fuse bits. When these bits are erased, they are at 1b. • For AVR UC3 A0, A1: the general-purpose fuses set to FC07FFFFh. • For AVR UC3 A3: the general-purpose fuses set to FFF7FFFFh. • For AVR UC3 B0, B1: the general-purpose fuses set to FC07FFFFh. So it means that DFU is triggered as soon as it starts? So why doesn't my computer recognize the chip? Or.. my chip has been changed by some stores after the factory, or it is caused by different revisions? Oh, the frequency of my crystal is 16MHz, does it affect the ISP? the internal RC Oscillator as clock source. , which seems that it may not the problem of the crystal source. This is the reference which I used to design the board, and the PA13 is the bootloader enable pin that is announced in. I think that it is the meaning of 'pressing the joystick'. OK so if you just wire up D+/D- from the micro to a USB port on your PC does it immediately enumerate as a DFU?